Have you ever heard about the Corcovado National Park in Costa Rica? If not, we are here to introduce you to a very wonderful, and even mystic, place! We are going to start from the very beginning to help you understand where is located Corcovado and how you can get there during your vacations in Costa Rica. The Corcovado National Park is located in Peninsula de Osa, at the Southwest of Costa Rica, and it is part of the Osa Conservation Area. The park was founded on October 24th, 1975 and it comprises an area of 45757 hectares of land and 5375 marine hectares. Here in Corcovado, the biological diversity is simply unbelievable and also very surprising for anyone who approaches its hidden places. This area is considered a truly important piece among the national parks and biological reserves wide system. This Costa Rica national park retains the largest primary forest in the American Pacific, along with one of the few significant remnants of tropical rainforests in the world. Corcovado is large enough to house important populations of endangered species such as the tapirs (also known as “dantas”), jaguars, and wild pigs. Besides, the area hosts 140 species of mammals, which represents the 10% of the mammal species of the American continent. Birdwatchers from all around the world have been delighted by the abundance of bird species because the park has several hundreds of them. This is a real paradise if you want to be in close contact with the rawest form of wildlife. The abundance of this wildlife can be explained in part by its varied vegetation -of which there are 13 types- including mountain forest (this type covers more than a half of the park), mangrove, alluvial plain forest, prairie forest, and many others. Together, all this vegetation density, contains 500 species of trees. A huge amount if you take into consideration that it is a pretty small piece of land. Another reason that can explain this biodiversity is the one that says that Costa Rica is located in a biological corridor of fauna and flora. And, if you want to came here then you must know that the average annual temperature is 27.5 degrees in the Celsius scare. But during the day, the temperatures can easily rise to 35 degrees. What if you want to travel there? The part is opened to the public, but you must book the tour in advance, and enjoy it as a part of your Costa Rica vacation package. But, before thinking about a trip here, then you have to be aware that you will be walking in a very diverse and wild environment, so you have to be careful and take the necessary precautions. If you don’t want to be really involved in this adventure, then you will probably be happy to know that some Costa Rica hotels of the area have their own private biological reserves within the Corcovado area. This way you can experience a little bit the feeling of being immerse in the pure nature. In the Corcovado National Park there are two main trails, one running along the coast, and another one carving to the interior of the forest. Also, there are four ranger stations in which three of them are located at the entrances of the park, and one is located where all the trails cross. These stations receive the names of Los Patos, Sirena, and San Pedrillo. To get there you can drive your own rented car, ask for private transfers (these are the better option because generally the hotels offer the possibility to take you there), or arrive to the heart of the park flying (arriving at the Sirena station). To walk the park, it is necessary a good or acceptable physical condition, to have to or three days (at least), to plan previously the paths and strategies to cross the park and, of course, to have precaution. In addition, just for you to have an idea of how depth is the forest, it must be taken into account that there are crocodiles living in the rivers, and at high tide there are even small species of sharks which swim to the estuary looking for some food. The majority of the animal sightings take place on the beach path. Here, it is possible to easily spot animals such as macaws, hermit crabs, pelicans fishing in the ocean, anteaters, Caribbean monkeys (capuchins), Spider monkeys, coatis and woodpeckers. The strong rains here are one of the main reasons of all this crazy amount of biological diversity. The rains create a great quantity of little rivers and water places, and this benefits the development of rainforests with tall trees. Corcovado has an unusual level of biological diversity which is not exceeded by any area of similar size on the whole world. This region includes 25 to 30 ecosystems. You are standing in front of a magical and unique place on earth. But, these data not only stand for the land territory of Corcovado Costa Rica, because the national park also protects an important marine extension (almost 54 square kilometers). Here, a great variety of this wildlife is developed; for example, it has been discovered that going to the east of the park there is a breeding area of humpback whales that comes from different part of the hemispheres. And… What about the recognition of Corcovado beyond the borders? We can proudly say that the Corcovado National Park of Costa Rica was highlighted in September 2016 as the best national park of the planet, according to the company Discovercorps, which specialists in travels and trips. The study mentions Corcovado at the top in a list of ten national parks, where there are included too the Grand Canyon in the United States, and the Galápagos Islands of Ecuador. “Within its borders there are diverse ecosystems, including mountain forests, cloud forest, prairie, and mangrove forests,” the publication said. The park has been also recognized by the National Geographic as “the most biologically intense place on Earth.” A truly honor taking into consideration the small piece of land that we truly are. Here in Corcovado it is possible to find all the monkey species of Costa Rica, two kinds of sloths, jaguars, crocodiles, and even harpy eagles. All those species live in what is considered the most important nature reserve of the country. To stay in this pristine area, we highly recommend you to stay in a hotel of the area; these ones normally offers a full board plan for you to worry less about what to eat and where to go, because you will be in the heart of the rainforest. 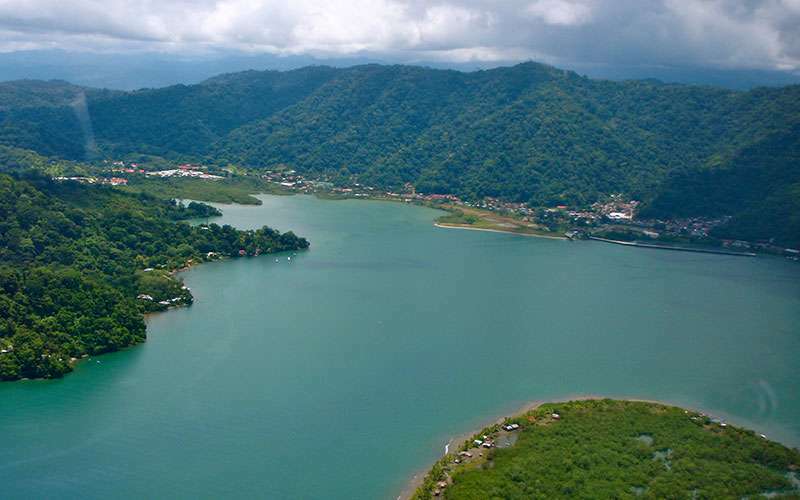 And, as mentioned before, you can drive there, but the easiest and fastest way to get there is to take a local flight from San José and arrive in Puerto Jimenez or Golfito. Once your flight arrive you will have someone part of your hotel’s staff waiting for you to take you directly to your hotel in order to start your unforgettable adventure for the next few days. If you want to know more, please contact us. We will be more than glad to assist you in the planning of your trip or giving you more information.